The celebration continues — I woke up to find out that Prizm has put A Harvest of Ripe Figs up for preorder for $4.49. The plot: lesbian queen (in lilac) goes on detective hunt to find a young music star’s stolen violin and root out the illegal magic that may have been involved. The release date is January 21, and it’ll probably be that weekend by the time it’s available on Amazon Kindle and February 11 til it’s for sale in paperback, but if you buy this version, 1. I keep more of the royalties (which until the end of March I’m donating to trans charities), 2. you get FOUR eBooks in one (pdf, html, epub, mobi) and 3. you probably get to be among the first to read it. Above artwork by Becca Schauer. 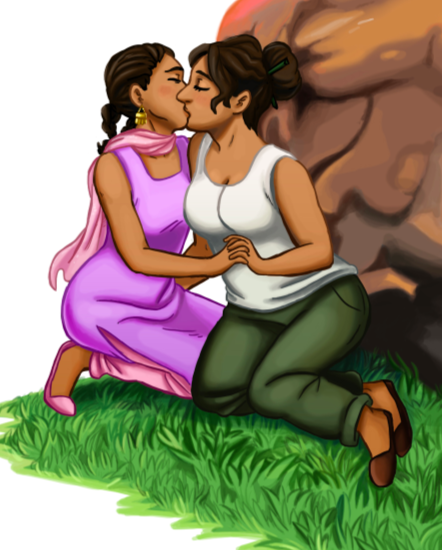 This entry was posted in Uncategorized and tagged bisexual, books, eBooks, fairy tales, fantasy, fantasy lit, femslash, fiction, girls kissing, glbt, lesbian, lesbian fic, lesbian fiction, lesbian mystery, lesfic, lgbt, lgbtq, mystery, mystery novel, new adult, novels, queer. Bookmark the permalink.